In what could be my last groundhop before Christmas, I was faced with 3 choices. Fo a long while I’d had a revisit to Braintree pencilled in, as they were playing Wrexham live on BT Sport and were doing tickets for £10. But then the group of hoppers I talk to on WhatsApp announced that most of them were off to East Preston v Worthing United in the Sussex County League. It would be a few miles nearer and a new ground, so I decided to go for that instead. I’d been hoping that Anwar could come along with me, unlike many of my recent hops, but due to having a lot of expenses lately, he was unavailable, A lot of that expense was for the Wycombe Wanderers v Aston Villa tickets, which at £25 were over twice the cost of what I pay per game with my season ticket. I wasn’t that fussed to be honest, the club have to maximise their revenue opportunities where they can, though I’d preferred them to have done the season tickets mega cheap, even though my cost of £11.20 a game is acceptable. In fact the main thing people were moaning about on the forums was that Aston Villa had been given the old Main Stand, and the amount of time it took to get through on the phone, I got the engaged tone until the 10th attempt, then sat on hold for 25 minutes, before bagging one of the better seats in the house. 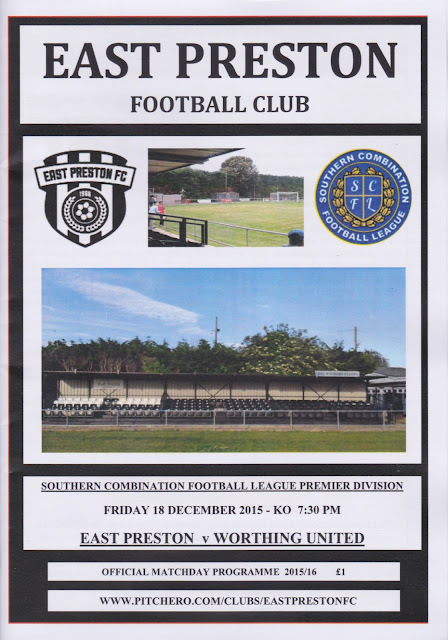 EAST PRESTON in it’s present form were established in 1966, though there was a previous club of the same name that disbanded around 10 years earlier. Playing in local leagues at first, they became founder member of the Sussex County League in 1983. 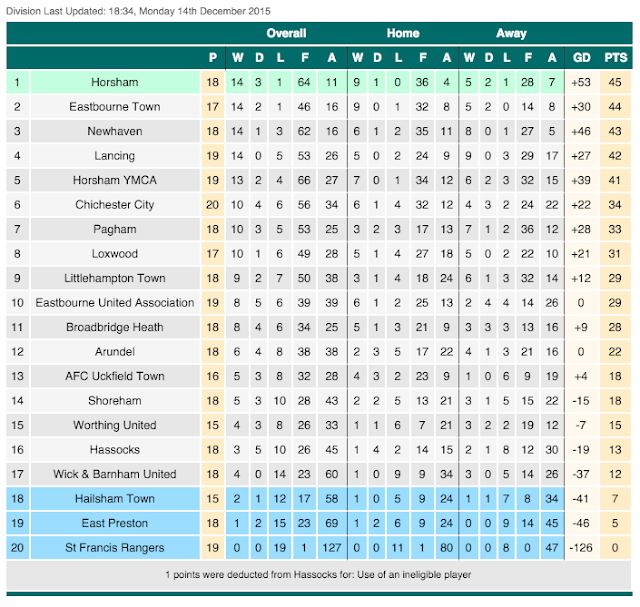 All but one season up until 1995 were spent in Division 3, but that year they won promotion to Division 2 after finishing runners up to Midhurst & Easebourne. 7th and 6th placed finishes in their first 2 seasons were great progress but this was trumped in 1998 when they were promoted to the Sussex League’s top tier. 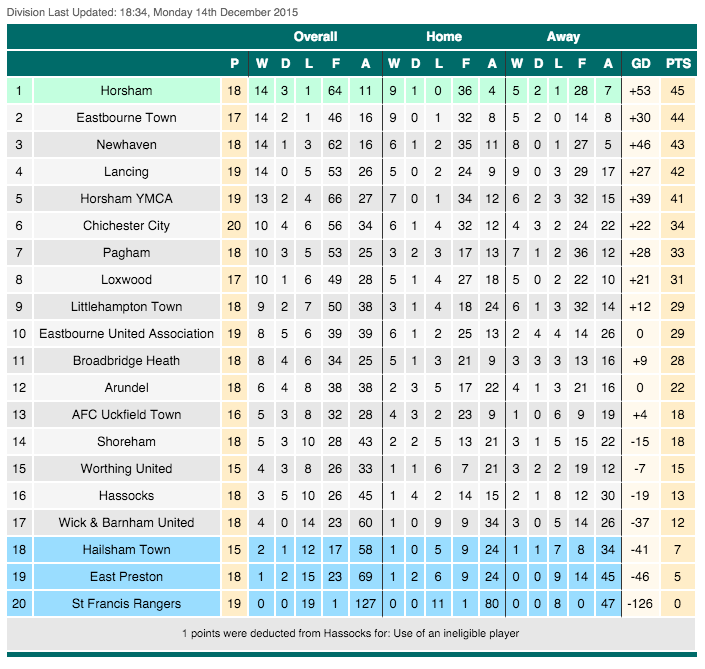 Since that elevation they have spent all but 4 seasons at what is now step 5 with them being champions in 2013/14 but opting not to take promotion to the Isthmian League. At the start of the season the league was renamed the Southern Combination Premier Division. So far they have struggled, with only pointless St Francis Rangers keeping them off the bottom of the table. The best ever FA Cup run came during the 2004/05 season. 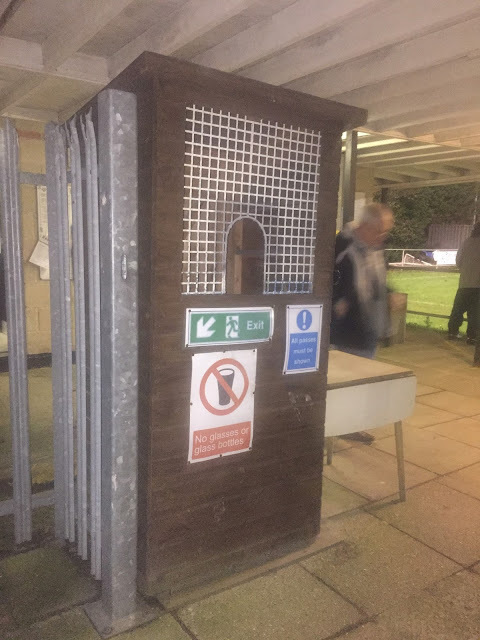 Rye & Iden United were beaten after a replay in the Preliminary Round before impressive victories over Merstham & Uxbridge set up a 3rd Qualifying Round game against Billericay Town where their run ended with a 2-0 defeat. Their championship season of 2013/14 also saw their best ever FA Vase Run where they got all the way to the 5th Round before losing to Leicestershire side St Andrews. 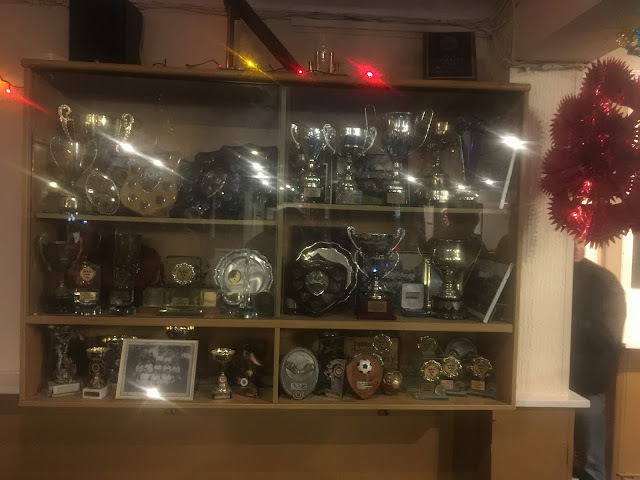 In terms of local competitions there have been a number of cups won within the Sussex County League as well as the Sussex Intermediate Cup in 1995, the Brighton Charity Cup in 2010 and the Sussex Royal Ulster Rifles Charity Cup in 2013. The village itself is near to Littlehampton and was once home to, in my mind, the best football presenter ever in Des Lynam. The rest of the week was pretty quiet. I went to Wycombe v Notts County on Tuesday, and yet another underwhelming home performance saw us draw 2-2 with mid table Notts County, despite the opposition having 10 men for an hour of the game. It was a hard week at work, so I treated myself to a few pints on the Wednesday while watching Whitehawk’s unlucky FA Cup defeat to Dagenham. The day of the game at work was very quiet for a Friday and I was out by 12.30. I was disappointed that I couldn’t have the 28th off as I have family around the day before and was planning on a few drinks. I should have done what most of the other sods do at my work and taken it off sick but I’m far too honest for that. I spent the afternoon relaxing at home and was very surprised when Braintree Town v Wrexham was called off due to ‘player safety’ concerns. It hadn’t rained for 2 days and although they gave people fair warning to save wasted journeys, it’s pretty pathetic for a club at that level. Happily there were no reported problems at East Preston, so my evening was not ruined, which it would have been had I opted for a revisit Essex way. I was pretty bored for the last part of the afternoon and was glad when it came to just before 4PM and it was time to leave. The journey started off well enough although getting through Beaconsfield was slow. However as soon as I hit the M25 the misery predictably started. It's always bad around the Heathrow area and tonight was no exception. In fact it wasn’t until I got past junction 10 for Kingston that things got going, but from then on I made up time. Even so I was still an hour behind where I wanted to be, as I suddenly remembered I added two get some cash to get in, and also feed myself. I stopped in Angmering which was the nearest town to the ground. There was a Co-Op there, which had a cash machine but it was out of service. Luckily they did cash back and they had something decent to buy in a local cider. Co-Op always tend to stock local products and I hit the jackpot in Frome before with £30 worth of new cider. 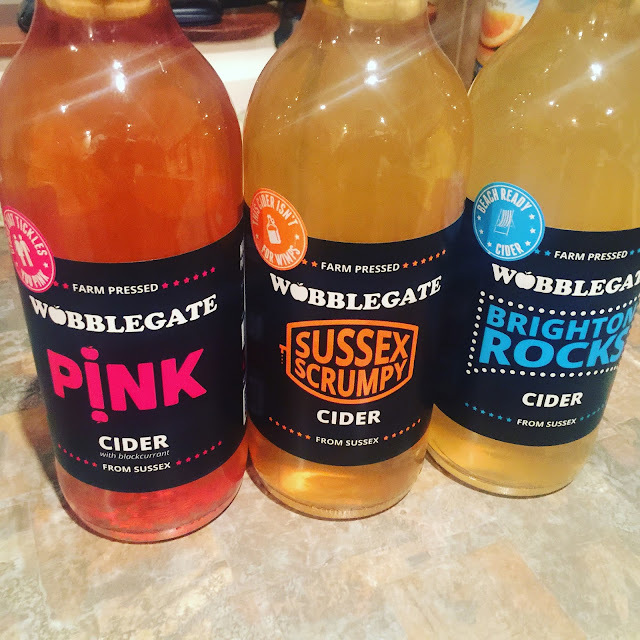 This occasion was on a smaller scale but I still managed to pick up 3 different bottles from local producer Wobblegate who were based down the road in Bolney. I also got myself a generous portion of chips before driving to the game. I eat my dinner outside the ground before going in the bar to meet Luke, Andy and Vinny who as fellow hoppers had come to the game. I had myself a pint of Strongbow while chatting to the lads with subjects ranging from Wonky Head (a well known groundhopper) and Milfs. With 5 minutes to go, most of us made our way out to the game, though Luke opted to remain in the bar until 10 minutes from the end of the game, which turned out not to be the worst decision in the world. 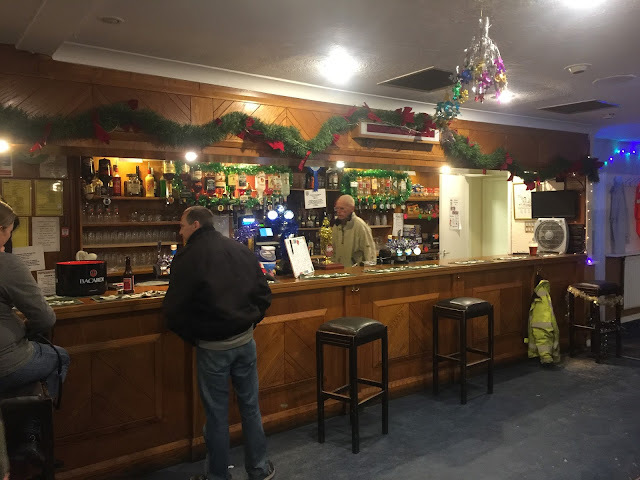 I was happy later to win £10 off a 50p scratchcard in the bar, with me enjoying some luck this season after pocketing £20 at Harrowby on another lottery. 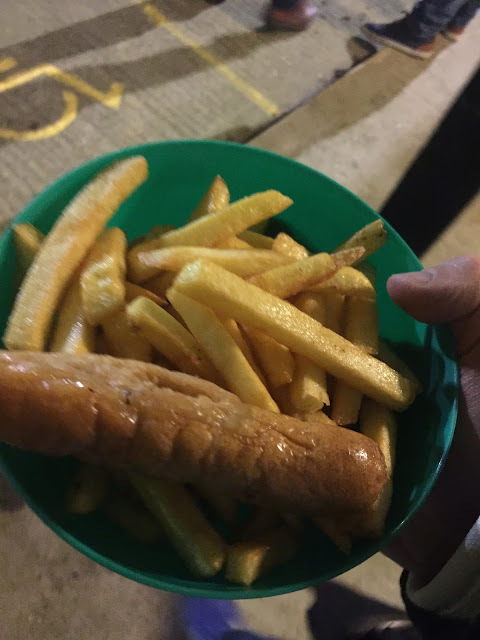 I was still slightly peckish when I got in the ground, so I got myself a Sausage and Chips for an excellent value £2 from the tea bar. It came served in a proper plastic bowl as well as the tea coming in china mugs. The main thing of note from the home side was a brilliant set of youngsters who were the self styled ‘East Preston Ultras’ They were in great voice all game, with a varied repertoire of songs and even a conga at one point. Absolutely fantastic support and a refreshing change from armchair fans. Sadly they did not have much to cheer about. Worthing United dominated the first half, hitting the woodwork on a number of occasions. The hosts improved in the second, having some bright spells at the start but soon the game settled back into the Worthing dominating and East Preston hanging on scenario. It had been a reasonable game but there had been little in terms of clear cut chances. East Preston will have been pleased with the clean sheet after conceding 25 in the last 5 games but will have been disappointed in their performance overall. I made good time getting home, walking though the door before 11 and having a cider while I typed my blog and watched Youtube videos. THE KASHMIR is a pretty well specced ground for step 5, There is an area of covered standing on one corner of the ground, probably holding around 200 and at one point, this was the only cover at the ground. Recently though a metal stand holding 150 has been added to the ground while further open standing gives the ground an overall capacity of 2000. The bar offers a fairly basic selection of drinks, whilst the tea bar offers a great range of items at good value prices. The village is a short walk away, with a range of places, though I didn’t have time to explore further.